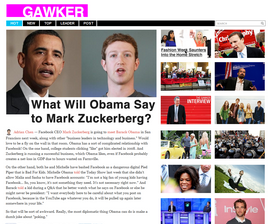 It is no surprise that Gawker’s new design is driving people away. The reasons are simple: there is less content on the page and page load time is significantly slower. This is my attempt at redesigning the site to its optimal. Please note, I am designing with the ultimate goal of increased page views in mind. If there are other user happiness success metrics that Gawker has that I am not aware of, it is not addressed with this first stab design. Ah, this is so much better!! You should send this to them. Really like what you got going on with the right nav stickiness idea. I would find myself spending much more time on the site “going down the rabbit hole” like Wikipedia this way. @Chelsea Yes, planning on it. @Brent Exactly, that is what I had in mind. It works really well for YouTube. Much simpler design – I like!! combine your pretty images with their labels that communicate the different categories that articles might fall under and you have yourself a winner. I love what you have going on but I dont want to mouse over everything to be able to read at least the category. So far so cool. But you also need to make sure it works so well. Make it a Chrome extension. Simplicity, Colors, JPcomments #ftw JP revamp > gawker. i love it. 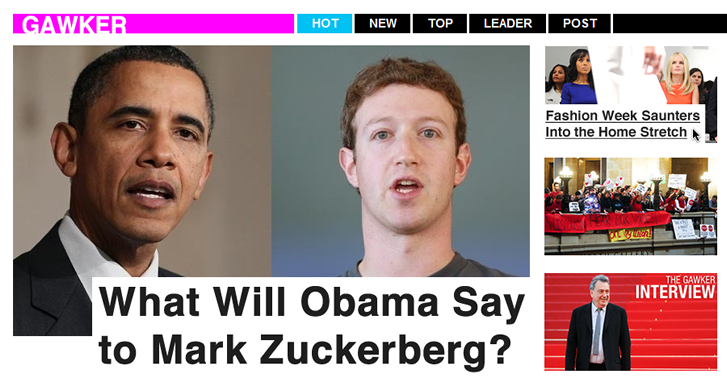 I just don’t see what’s wrong with the current Gawker sites. I kinda like the design and layout. It’s good, but personally I dislike too much content on the right. On many sites this space is used for ads and non important content, and my eyes get drawn away, back to the middle or left of the page, where the main block of text is too large. I like the new design, but I don’t like the mystery meat navigation on the thumbnails. 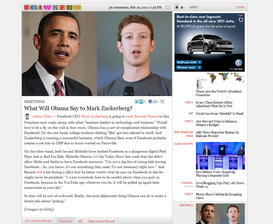 Don’t just display the headlines on hover. 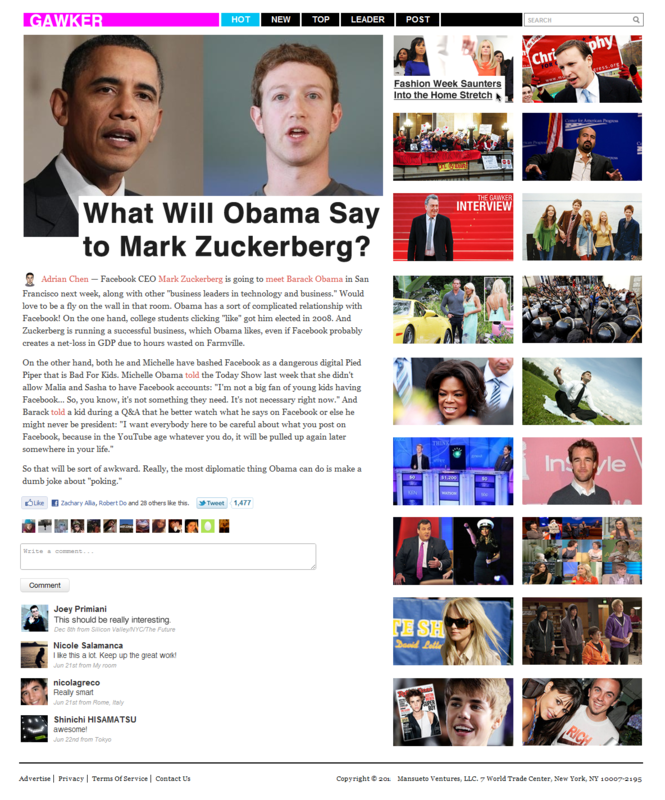 Case in point : http://t.co/sPRb5Si Nice design work, but omits many difficult elements. Feb 21st, 2011	from Inside your phone.